Joe Biden is a character, and I sure hate to discourage that. He runs the REAL straight talk express this year, which will be exciting and doom him to failure. After waiting a good 20 years to atone for his blatant copying of a British politician's speech, he launched a new campaign this year and lasted about 4 hours before he shot his mouth off and caused another scandal, just because he marvelled that Obama was a black candidate, and nonetheless clean! Here's hoping he stays in the race, and attends all of the debates, until the bitter end. ""I've had a great relationship [with East Indians in America]. In Delaware, the largest growth in population is Indian Americans - moving from India. You cannot go to a 7-11 or a Dunkin' Donuts unless you have a slight Indian accent. I'm not joking." -- Joe Biden, speaking to Indian-Americans. The irony is, coming up with things to say has never been a problem for him; he's by all accounts a very bright and original thinker. (He is currently the main advocate of the plan to partition Iraq informally into Kurdish, Shiite and Sunni regions.) And yet, this was not his first offense of plagiarism. As a freshman in law school back in 1965, he got an "F" in a class for writing a paper entirely based on one law review article. (He described the incident as "something very stupid 23 years ago." Biden repeated the class later and got a good grade.) He also used parts of old speeches by Robert Kennedy in his 1988 campaign (which he blamed on a speechwriter). It's hard to understand. Our best read on the guy is that it's simply an issue of laziness. The deeper problem that ties together his plagiarism and BS is laziness. 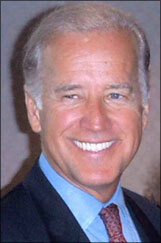 Biden is a smart enough guy, a college football and baseball jock who is undoubtedly great fun to hang around with. I'd love to have a beer with him. It just seems that he has never had to knuckle down be diligent in his public speeches. He's more the kind of guy who is used to winging it, pulling it off at the last second with his nerve and wit. But it's clearly gotten to the point of limiting what he can accomplish. Unlike the second president Bush, he doesn't seem to be INTELLECTUALLY lazy or resentful -- Biden is wiling to entertain challenging ideas and go out on a limb. But they do share a certain fun, party guy mentality. You can just see them at parties BSing impressively while their friends roll on the floor. This isn't just my opinion. At the University of Delaware, Biden was 506th out of 688 classmates, and a history professor said he was "trying to be the complete Joe College." In a recommendation for law school, the teacher called Biden average in "intellectual achievement" but high in "command of English language" and recommended him based "on grounds of personality and general promise." Biden ended up 76th out of 85 in his law school class; the law school dean described him as an academic "disappointment" but praised his "confidence," "general physical appearance" and "general speaking ability" in recommending him as a lawyer.